No Cambodian has been reported missing in Japanese quake | I see Cambodia! I see Cambodia! Stories, events and testimonies from Cambodia. 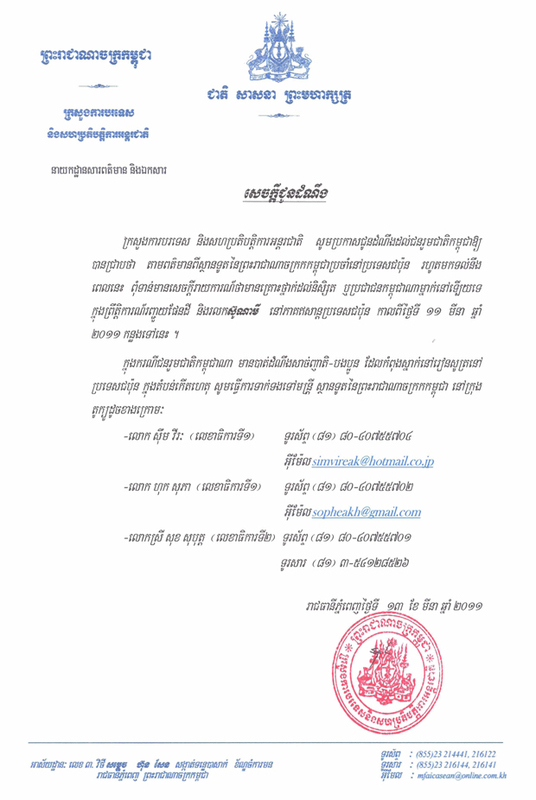 Official statement of the Royal Ministry of Foreign Affairs about no missing Cambodians so far in Japan. Primer Minister Hun Sen sent his condolences to Primer Minister Naoto Kan and the people of Japan. The Royal Goverment of Cambodia and the Cambodian Red Cross has donated 100 thousand US dollars and 20 thousand US dollars respectively to the Government of Japan for the relief of the victims by the 8.9-9.0 MW megathrust earthquake off the coast of Japan that occurred at 14:46 on 11 March 2011 (in Cambodia was 12:46 on March 11). The epicenter was reported to be 130 kilometers off the east coast of the Oshika Pensinsula. The tsunami did not affect the Cambodian coasts. According to the census of 2010 of the Cambodian Student Association of Japan, there are 331 Cambodians studying in Japan. However, there is not a report of Cambodians working in that country and none of Cambodian tourists that were in the area during the earthquake. If you are a Cambodian in Japan or you know Cambodians in that country, feel free to use also this website to report any incident or ask information for Cambodians. Albeiro Rodas (in Cambodia Sky Ly Samnang), is a MA in Digital Communication, independent journalist and a Salesian of Don Bosco from Amalfi, Colombia, based in Cambodia since 1999. He is the creator of the Don Bosco schools of journalism in Sihanoukville and Kep with young people from poor communities and the founder of the Don Bosco Kep Children Fund. Medal for Social Commitment UPB (2010); among the 100 more upstanding Colombians abroad (Marca Colombia, 2012, http://www.youtube.com/watch?v=X39xwdGtVXI) and among the 12 Colombians that are making this a better world 2013 (http://www.colombia.co/en/culture/colombians-that-are-making-this-a-better-world.html). Hello, I am from Preah Sihanouk Province. I communicate that we got a message from my brother Yareth in Shiga, Japan and he is well. No more news about other Cambodians. Hope they are ok, good in health and coming back to their homeland and condolences for Japanese people. Are you returning to Cambodia, the country of your ancestors? Visit this site to see how to survive and integrate into the Cambodian society.